The BA program is designed for students who have a strong interest in another discipline and wish to pursue their studies in that discipline as well as in business. If you have questions about or want to enroll in the undergraduate business program, please contact us to schedule an appointment or visit during walk-in hours. 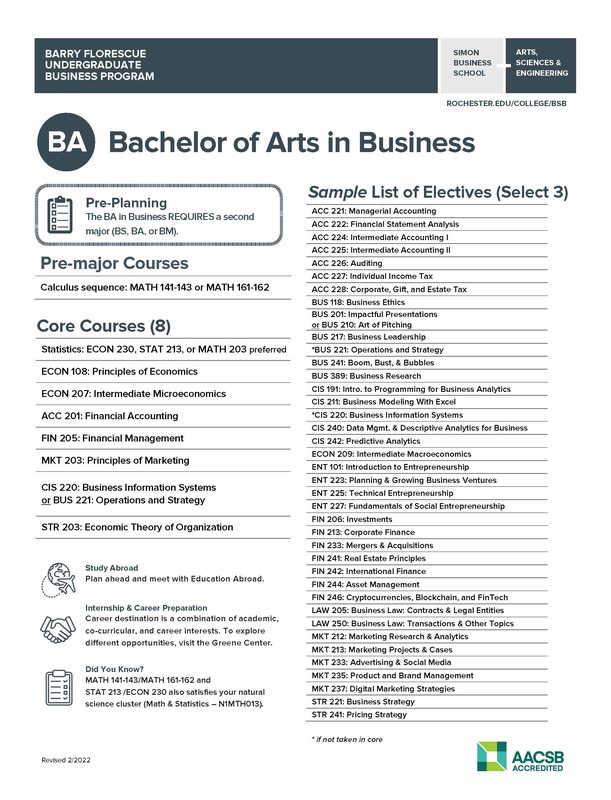 The BA degree in business consists of eleven courses with a calculus prerequisite. The major satisfies the social sciences division of the Rochester Curriculum, and students must meet prerequisites and/or co-requisites for individual courses. Completing the required coursework above satisfies the College’s upper-level writing requirement. *Students who received AP or IB credit for ECO 108 must take one additional higher-level ECO course.